This design was made with existing barges in mind. With the growing need for LNG transportation, some barge owners may consider outfitting some vessels to accommodate this new demand. 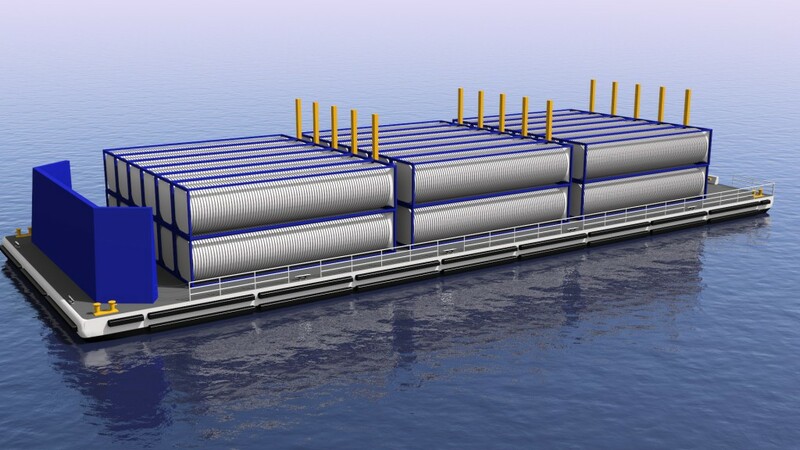 This vessel design utilizes modular LNG tanks. The advantage of these modular tanks is that there’s no ship to shore transfer necessary. The modules fit right onto a flatbed truck, much like a shipping container. The modules can also be used as the fuel source on deck for a ship that uses LNG. This system avoids any bunkering problems that arise, such as restrictions in port, spillage, and extended procedures while bunkering. Handling of the modules is standard practice in container ports. This reduces time in port and allows the vessel to transport more fuel over the course of a year as compared to a traditional bunkering vessel.